Instructions: This Posit It Note box is 3 1/4" x 3 1/4" square x 1 3/8" high. See here for more photos. Cut two pieces of black pearl metallic cardstock 6" x 6" each. Score both on all sides at 1 3/8". From the red designer paper in the Camelia Carnation paper collection, cut 3 pieces 3 1/16" square and four pieces 1 1/4" x 3 1/16". Ink all of the edges of the designer paper with Black Soot Ink. For the bottom of the box, using a scissor, cut from the edge to the 1 3/8" score line on all four corners. Cut out a notch on both sides of all four corners. Burnish all folds with the bone folder from the Scor Pal. Add Dries Clear Adhesive to the corner flaps and adhere on the inside to form the box. Put clips on these corners until dry. Adhere one of the 3 1/16" pieces of designer paper to the inside bottom. For the top of the box, using a scissor, cut from the edge to the 1 3/8" score line on the two front corners. Cut out a notch on both sides of the front corners. Completely remove the two back corner squares. While the top is still flat, adhere the inked designer paper to the top, all four sides, and the inside top. Burnish the folds, adhere the tabs in the front to the inside and adhere the back flap to the back of the bottom box. Stamp the Large Camelia 4 times on white cardstock using Lipstick Red ink. Diecut using the coordinating die and color the 4 second largest petals with Lipstick Red and Berrylicious. Color the back edges also. Place the diecuts in the mold, spritz with water and run through die cutting machine. 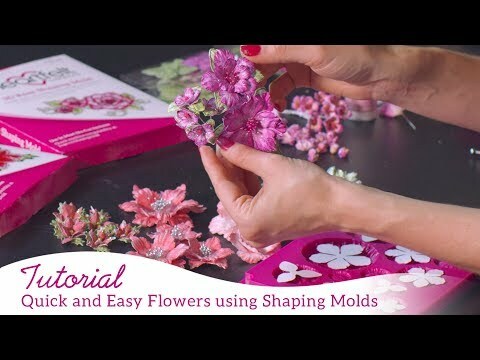 Flip out onto the molding mat, use the stylus to press down in the center of all the petals and gently add additional shaping to the petals with your fingers. When the petals are dry, adhere one on top of the other making sure to offset them. Sponge the edges with dries clear adhesive and sprinkle with Rajni Chawla's Crystal Clear. S Stamp the leaves twice with Mint ink on white cardstock, color with Bamboo Leaves, diecut with the coordinating die and shape using the deluxe flower shaping kit. Sponge the leaves with dries clear, sprinkle with Crystal Clear and adhere the carnation to the box with hot glue. Add three pads of Post It Notes to the box and it's ready for gift giving.